If I argued that those arrested for online child p-rnography deserve a fair trial, would anyone accuse me of being an apologist for child p-rnography? If I suggested that a former senior cop charged with drug importation deserved a fair trial, would anyone accuse me of being an apologist for drug trafficking? But if I suggested that the five men charged with being responsible for the September 11 attacks on New York and Washington deserve a fair trial, I’d be labelled by some as an apologist for terrorism. Indeed, some would look at the name my parents gave me, the city I was born in and other factors completely beyond my control and cast a host of aspersions. It’s as if no-one having the same combination of ethno-religious factors died on that fateful day in New York or Washington. ... is a fundamentally flawed process … Our nation deserves better than this. All dressed in white and without handcuffs, the five - including Khalid Shaikh Mohammed, the alleged mastermind of the attacks, which killed about 3000 people - were seated at a table with their military defence team. Khalid, a Pakistani, and his alleged co-conspirators Ramzi Binalshibh, Ali Abd al-Aziz Ali, Wallid bin Attash and Mustapha al-Hawsawi all face the death penalty if convicted by the military commission on the US base on Cuba. Charges against them include conspiracy, murder, attacking civilians, intentionally causing serious bodily injury, destruction of property, terrorism, and material support for terrorism. The men appeared relaxed as they chatted in Arabic, waiting for the start of the hearing, atwhich the charges will be read by judge Colonel Ralph Kohlmann. The judge opened the military commission by saying the Government would consider any statements by the five as confidential because of their detentions in secret CIA prisons. "Any statement by any of the detainees is presumptively classified," Colonel Kohlmann said. That meant there was to be a 20-second delay before the defendants statements were broadcast by video to the nearby purpose-built press room, to allow prosecutors to cut sensitive information. At the start of proceedings, Khalid threw out his defence team and said he would represent himself, before adding that he wanted to be sentenced to death and become a marytr. The military tribunals have been mired in controversy since they were established by President George W. Bush at the end of 2001. In 2006, the US Supreme Court ruled they were illegal, but then Congress adopted a new law allowing for them to be re-established and for indirect witness statements or testimony won under duress to be submitted as evidence. Brigadier General Thomas Hartmann, legal adviser to the military commissions, said the defence team had been granted "extraordinary" rights. But he noted that if they suspects were acquitted, the they could still continue to be held until the end of the so-called "war on terror". Defence Counsel Colonel Stephen David should be glad I’m not one of the judges. 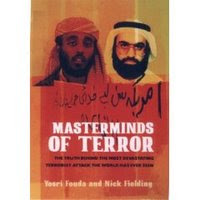 I’m convinced of the guilt of at least 2 of these men, having read the masterful work of journalists Yosri Fouda and Nick Fielding called Masterminds Of Terror: The Truth Behind The Most Devastating Terrorist Attack The World Has Ever Seen. Fouda was chief investigative reporter with Al-Jazeera who spent 48 hours with both Ramzi Binalshibh and Khalid Shaikh Mohammed in a secret Karachi location. Fouda includes in the book the full transcript of his interviews with RB & KSM as well as RB’s own written justification for the attacks. These men followed a demented politicised theology that was more anarchic than monotheistic. Some may wonder why it is that more Muslims than non-Muslims die from attacks by terrorists like KSM. Why don’t these men make exceptions for their own kind? The reason is simple – according to al-Qaeda theology, virtually all Muslims are infidels, and the blood of an infidel (including my blood) can be spilt with impunity. Unless Yosri Fouda is making it all up, these men are guiltier than sin. Yet still they deserve a fair trial. Evidence should be obtained without the use of torture in secret locations. Due process, not kangaroo court process, must be applied. If fair trials can be granted to suspected war criminals, surely they can be granted to terror suspects. We hear it time and again from chest-beating politicians – the terrorists hate us because of our values. By denying terror suspects a fair trial, we are showing we hate our values at least as much. An edited version of this piece was first published in the Crikey daily alert for 6 June 2008.